Those of you who know me know I’m a big coffee drinker. But what’s funny is that I also drink a lot of tea. Iced, hot, frozen, it really doesn’t matter, as long as it’s tea. And what kind? I drink black, herbal blends, and green teas. I’ll share some benefits of each type and I’ll give you a great tea recipe at the end. Technically, “tea” is only tea if it comes from the Camellia sinensis plant. All tea, whether it’s black, white, green, oolong or pu-erh, comes form this plant. It’s the processing that distinguishes different types of tea. Black tea, the most common, is the basis for many types of tea. Several manufacturers of iced tea use black tea. It’s made from fermented and cured tea leaves. It has the highest caffeine content of any of the teas. Along with the other teas, it contains polyphenols, antioxidants that help protect the body against free radicals – those that can cause cancer and other ailments. Black tea also helps to inhibit bacterial growth in the mouth, slowing down the formation of plaque. Drink your tea black if you’re using it for this purpose. Sugar helps bacteria grow, as well as the acid condition that lemons contribute to. Green tea is made from steamed leaves. It is the highest in EGCG, one of the catechins (a type of antioxidant), that helps with weight loss. Green tea also helps to remove radiation from the body which makes it great for those on cancer treatment. It also contains micro nutrients that will help the body when stressed. There is still caffeine in green tea, but not as much as in black tea. I don’t care for the taste of green tea, which is kind of blah. Add lemon or stevia to perk it up, or like i did today, smash a few blackberries in it. You can also get the benefits of green tea from capsules or tinctures. White tea is the most mild of all the teas. It is made from the uncured, unfermented tips of the camellia tea plant. Like bean sprouts, the tips contain all the enzymes, vitamins and minerals that the plant needs to survive, but in a concentrated form. It is also the most concentrated in the cancer fighting EGCG. Steep white tea for only a few minutes or it will become bitter. Oolong tea is partially fermented leaves of the tea plant. It’s said to be a cross between black and green tea. Some like the taste, some don’t. It combines the benefits of both types of tea. Pu-erh is fairly new to the Western world, but has been consumed for centuries. It is fermented and aged for a period of time, giving it a stronger flavor. It is a type of black tea that is pressed into cakes. From there it is brewed for a short time. Chamomile is great for stomach ailments and can help you sleep. Passion Flower is also calming and can help you sleep. Hops and Lemon Balm are also great sleep aids. Valerian can help you sleep, but has a noxious smell. It’s recommended taking this as a capsule not as a tea. Ginger is anti-inflammatory, about the same as an aspirin, and can help with joints, such as with arthritis. It is also great for nausea as it help calm the stomach. It is also warming. Licorice root can help to regulate blood sugar and add sweetness without calories. Nettle tea contains antihistamines. It can help combat hay fever and allergies. It also contains many vitamins and minerals. Lemon Balm is also antiviral and can help fight illnesses. I used it last year to help fight a respiratory tract infection. Ginseng is an adaptogen. It helps the body to deal with whatever life throws at it. It can also help improve circulation, which can help with sexual dysfunction. We have to remember that although tea has been consumed for thousands of years in the East and has been used for many purposes, we are not doctors and should not try to diagnose or treat any serious illness. 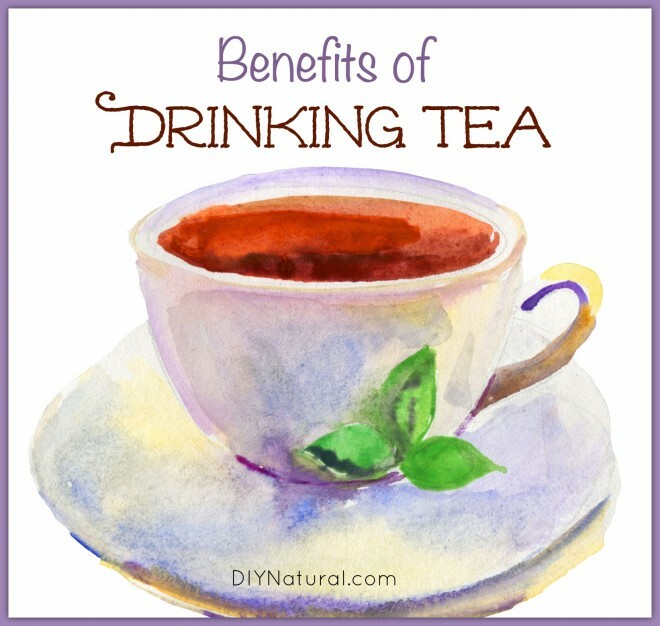 While drinking tea may not cure your ills, it certainly will help you feel better! If you are using bagged tea and are concerned about caffeine, soak the tea bag for 30 seconds in hot water, then throw that water out. (I add it to my compost.) Over 80% of the caffeine is released in the first 30 seconds. Then, go ahead with a second cup of hot water, steeping for 3-5 minutes. You might get a reduced taste, but you’ll get much less caffeine. Ever wonder why commercially decaffeinated teas taste weaker? Now you know why! Good news – tea is hydrating! It is now thought that the caffeine in tea is not as dehydrating as once believed. It has been found to improve kidney and liver function and help combat symptoms of bladder infections. Here is a great tea recipe. You can make it iced or hot, or as I do, frozen. Mix all of the above ingredients together, making sure all of the leaves are crushed. Store in an airtight container. For hot tea: Using a tea ball or make your own tea bags with the mixture. Steep 1 teaspoon in a cup of hot water for 5 minutes. Remove tea ball or tea bag and drink hot. For iced tea: Use 2 teaspoons and brew longer, until it is fairly strong. Remove tea ball or tea bag, allow to cool a bit and pour over ice. For frozen tea: Brew strong and allow to cool. Pour into a glass cake pan. freeze for an hour or so. Take a fork and flake up the ice crystals. Freeze another 30 minutes and flake again. After repeating this a few times it should be a consistency you like. Serve in a chilled sundae cup. Are you a tea drinker? How do you like your tea? Herbal teas has a lot of variety but I haven’t tried one. Thanks for the informative article. Another tea I’ve recently started drinking is dandelion root tea. It tastes pretty good, and is good for detox, digestion, weight loss, and it’s a natural diuretic. As with any herbal or natural product, one should always study up on possible side effects or interactions and introduce any new item slowly at first. For instance, dandelion may adversely affect those with ragweed allergy or taking diuretic medications. I just saw you did an article in May on dandelion. I’ll have to try the leaves sometime as well. Thanks for all the great info you provide! Thanks Sandy! I was surprised at how much I liked dandelion root tea too. It’s sweet and almost nutty. The leaves make a bitter tea, so I use the leaves in salads. This time of the year they can be tough, but try the softer inner leaves. They’re better and still have a lot of nutrients in them. I love the Cold and Flu tea that I believe diy posted long ago… I have made it many times and also given it as a gift. Switching gears, I mix decaf tea and decaf green tea and serve it as iced tea using stevia to sweeten…. thanks for another great article! Debra, I wonder if I can grow mint in the hot and humid mid-NC region where I live? We also get some cold winters here. You sure can, Louise. I lived in Minnesota before coming here to Western North Carolina. We grew many types of mint there. This past winter was very hard on some of my mint plants, but a lot of them were still in pots. All of the mints that were in the ground survived and it got down to 0 here for a while. And don’t worry about summers. Mint loves hot and humid. I came here to say, what about rooibos. 🙂 I am in Texas and when a friend from Germany visited 3 yrs ago he introduced it to me. We have been drinking it ever since. I find it has a very calming affect on my kids. You are all right, I have forgotten rooibos. It’s a great tea and shouldn’t have been left pout. Sorry! It’s sooooo good for you. Thank you for this informative post on tea! Johanni has a great recommendation – Rooibos is up-and-coming in the United States and we often refer to it as “Red Tea” here, but the fact is Rooibos is an herb (it’s not from the Camellia sinensis plant). It has more minerals and antioxidants than green tea and has a mild flavor on its own. It is a great companion to other herbs and flavors – if you like to experiment with tastes. We offer Rooibos, many herbs, and all of the tea types on Design a Tea.com, our online artisan tea company – and yes – true to the name you can design your own custom blend! You should check out the benefits of drinking Rooibos tea (native to South Africa). You might find it interesting. As far as I know it is now available internationally.